This post could perhaps be a mistake, seeing as I'm working on glass 2 of a nice oaky chardonnay. Of all the white wines out there, I actually love a super duper oaky flavoured chardonnay. Perhaps this is because I am a red wine drinker, but nonetheless, this is tasty. Sadly, we were out of red wine, and I had a real hankering for a nice glass to sip away at....I worked late tonight, fiddling with photoshop and all that fun, so I thought I deserved a nice break. I also thought hubs deserved a lovely meal. You see, yesterday, I promised him a lovely meal, but sadly, failed to deliver on that promise. :( Yesterday, I got home from work, and my stomach just started to burn. I hadn't eaten much yesterday (very unusual) and I just spent the evening on the couch, groaning. Couldn't fathom eating or creating food. Today wasn't much better - I actually didn't eat until dinner (I think that was like 35 hours without eating......something that has never happened to me before, and probably will never happen again)....just sort of burned my way through work. So I thought that my lovely patient hubby deserved a nice meal tonight. I actually wanted to go out for dinner (lazy me! ), but a quick bank account check convinced me that wasn't really the brightest of ideas....he suggested a vegetarian night in. And then a little light flashed in my food-starved brain....a remembered a recipe that I'd seen a year ago (or so) for spinach walnut canneloni. mmmmmmmmmmmmmmmmmmmmmmmmmmmmmmmmmmm......all of a sudden food seemed appetizing again. Colourful, delicious, full of texture, silky nuttiness - what more could a gal ask for????? So we had a quick stop at the grocery store (social conscience also kicked in - sent hubs around with a mission to buy groceries to put in the food bank bin) and I got all the things I needed. Of course, you know that I am incapable of following a recipe as written....instead of canneloni (which in the recipe is actually LASAGNA - not the same thing people! ), I opted for jumbo shells. For most people, I wouldn't really recommend this recipe for a weeknight (takes about 1.5 hours) but for the patient, I think it's well worth it. The recipe could use a little tweaking, but the idea is FAB. Walnuts and pasta were made to go together. I can still remember the decadent texture of the walnut pasta I tasted in Siena on our honeymoon........droooooooool. 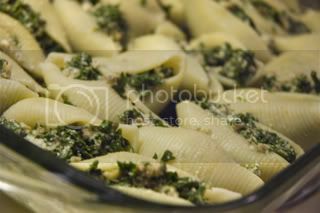 It was this luscious cream sauce (definitely not low-fat) and this beautiful al denta pasta....OMG amazing. 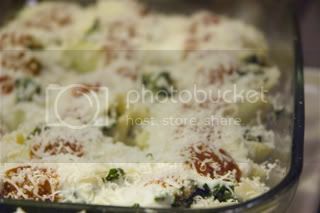 Here is a photo of the stuffed shells (yup - messy cook!). Stuffing shells isn't exactly my idea of fun, but it's easier than manicotti or canneloni (both of which are an absolute biatch to stuff! MEH). I, as always, got stuffing on the outside of the pasta, but no one notices this kind of thing....no worries! The beautiful thing about this recipe is the sheer amount of calcium it sneaks into me (I added a lot more milk to the sauce), and the fabulous amount of spinach. Can I just say how much fun I had chopping that stuff? Usually I'm lazy and use the frozen stuff, but this time I actually followed the recipe and wilted fresh spinach, and chopped away with my AWESOME chinese chopper. I feel super-duper pro-star when I use that knife. Anyway, I topped the shells with a bit of tomato sauce and some grated mozza and parmigianno. Yum. The tasty shells baked away, while I slaved away making another lazy caesar salad that I thoroughly enjoyed. Great recipe. I'm a vegetarian so that combination really interests me - the walnuts would be great for protein! You're always so creative and I make it a point to read your blog. RBM - you rock girl! I am so making (something like) that for dinner tonight! Love, love, love your writing...funny and smart...and interesting. Thanks for sharing your food world with us! well, if you get to write a drunken post, I get to leave a drunken (well, not really) comment. I loved stuffed pasta! We made something very similar last year. It was cannelloni/manicotti stuffed with a mixture of mushroom, onion, tofu, parmasean cheese, spinach and various herbs (of your choice). Then we overlaid the pasta with a homemade cream sauce. Finally, we sprinkled the top with a bit of cheese (we used old cheddar b/c it's our favourite). It turned out delicious. I like your idea of using tomatoe sauce though...maybe I'll modify my recipe and use shells pasta with tomato sauce and see how it turns out! !